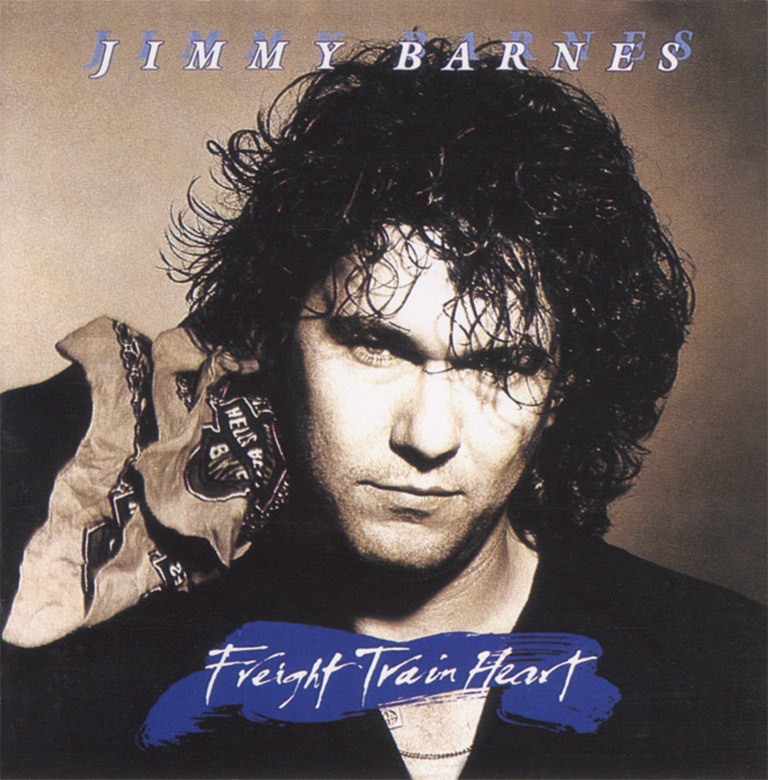 FREIGHT TRAIN HEART is an album by Australian rock singer Jimmy Barnes, released in late 1987 in Australia by Mushroom Records and in early 1988 in the US by Geffen. It spent five weeks at the top of the Australian Album charts in Dec 1987 / Jan 1988. Most of the tracks were written by Barnes and producer Jonathan Cain, however Waitin’ for the Heartache was co-written by Barnes and Desmond Child and Walk On was co-written by Child and ex-Rainbow vocalist Joe Lynn Turner. Two songs were also written with Jim Vallance. According to Vallance, Cain also contributed ‘later’, most likely during the recording process. Seven Days was a Ron Wood track originally written for him by Bob Dylan. This was the last song recorded for the album, and features INXS drummer Jon Farriss, bassist Chris Bailey and Rick Brewster from The Angels. Brewster, Johnny Diesel, Peter Kekell and The Angels’ Jim Hilbun were all hired after Barnes returned with the uncompleted master tapes from the initial recording sessions at the Power Station in New York, where he had fought for creative control with both Cain and Geffen Records. The album was completed at Rhinoceros Studios in Sydney with Mike Stone producing. Other guests to contribute include Huey Lewis, who provides backing vocals and harmonica on I Wanna Get Started With You, Wendy Matthews and David Glen Eisley of the melodic hard rock band Giuffria.